Should the U.S. Recognize Catalonia If It Secedes from Spain? Over at Learn Liberty, I take up the question of what the rest of the world should do if Catalonia’s referendum on independence on October 1 succeeds, as is expected. I apply some straightforward assumptions about justice and individual freedom to the case. Secession is hard because it always involves violating some people’s rights — but then, so does stopping secession. The question has to be about how to preserve the greatest degree of freedom. On March 15, I had the opportunity to testify at the U.S. House Foreign Affairs Subcommittee on Europe, Eurasia, and Emerging Threats, chaired by California Rep. Dana Rohrabacher, on the topic of whether the U.S. government should change its policy toward national self-determination movements. I’m posting here my written testimony (my oral testimony had to be briefer). The conversations with the congressmen were interesting, and I think they revealed something about the foundations of U.S. policy toward such movements. Rep. Weber grilled me a bit about whether countries such as Spain, France, and Italy that prohibit secession in their constitutions should not enforce their constitutions. I responded that these countries should change their constitutions. However, another point I would make now is that the purpose of constitutions is to constrain governments, not citizens. Statutes and administrative regulations constrain citizens, but the constitution in turn restricts the ways in which government can create and implement these rules. So a constitutional prohibition against secession could really be enforced only against government agencies, and a government would be well within its legal rights to allow citizens to pursue secession, even in the face of a constitutional prohibition. National self-determination movements seek greater self-government for a national minority, typically including the right to vote on forming a new independent state. Recent examples of successful self-determination movements include South Sudan, Kosovo, Montenegro, and East Timor. Ongoing self-determination claims are found in Scotland, Catalonia, the Faroe Islands, Kashmir, Tamil Eelam, Somaliland, Western Sahara, West Papua, Tibet, Mindanao, and many other places. Like other states, the U.S. government faces decisions about whether to recognize declarations of independence, to enter into diplomatic relations with new states, and to engage in diplomacy with other states about self-determination movements within their borders. In my testimony, I will first describe the current state of self-determination movements around the world, then summarize what scholars have learned about the relationship between self-determination conflicts and violence. I will conclude by assessing the validity of claims advocating the creation of new states or changes to national borders. Self-determination movements generally take one of two forms: political parties and armed groups. Currently, secessionist political parties that seek at least a vote on independence are found in Belgium (Flanders), Canada (Quebec), Denmark (Faroe Islands and Greenland), Finland (Åland), France (Brittany and Corsica), Germany (Bavaria), Italy (Veneto and Sardinia), Spain (Catalonia, the Baleares, the Basque Country, Navarre, Canary Islands, and Galicia), the UK (Scotland and Wales), and the United States (Alaska and Puerto Rico). In addition, irredentist parties, which seek to move territory from one country to another, are present in the UK (Northern Ireland) and Italy (South Tyrol). Armed self-determination movements are typically found in the developing world. Figure 1 shows where intrastate armed conflicts on territorial issues (generally, self-determination) occurred during the 2011-2014 period. These conflicts require at least 25 battle deaths in a single year to be counted. Developing countries usually forbid self-determination movements from organizing as political parties. For instance, Turkey, India, Pakistan, Sri Lanka, and Russia make advocacy for the self-determination of a particular region a criminal offense — an act that would be protected by the First Amendment in the United States. Western, liberal democracies typically allow secessionist parties to organize and contest elections, but they do not all allow for secession. The Canadian Supreme Court has ruled that Quebec secession is negotiable if the province votes by “a clear majority on a clear question” for independence. The United Kingdom negotiated the terms of an independence referendum for Scotland and agreed to be bound by the result. The Danish government concedes a right to independence for Greenland and the Faroe Islands, and breakup is routinely discussed as a legal option for Belgium. St. Kitts and Nevis and Liechtenstein have constitutional clauses protecting the right of secession. On the other hand, France, Spain, and Italy all have constitutions explicitly defining their countries as indivisible, thus proscribing secession. the September 18, 2014 referendum itself. Using data from the Minorities at Risk project, I found that as of 2003, 107 ethnonational minorities, 38 percent of the total number in the data set, had a secessionist organization of any size (Sorens 2012, 56). In a recent article, I estimated the percentage of the population supporting independence in every state of India, finding figures no higher than 20 percent anywhere (Sorens 2014, 264). Popular demand for independence comes from a combination of a distinctive cultural identity, territorial coherence, and either political or economic benefits of independence (Sorens 2005; Hale 2008; Sorens 2012). Having just one of these elements is not enough, which is why the vast majority of minority nations around the world do not have any secessionist movement at all. One worry about allowing secessionist movements is so-called “contagion” across regions or countries, but secessionism does not in fact seem to be contagious across countries, although it does have a tendency to spread within a country (Ayres and Saideman 2000; Sorens 2012), which is why governments often crack down on them (Walter 2006). At the individual level, there is some evidence that voter support for independence is rational, that is, related in the expected way to the expected benefits of independence (Howe 1998). However, there is a difficult-to-resolve debate about the extent to which independence support is caused by voters’ assessments of the benefits of independence, or if instead independence support causes those estimates of benefits through a process of rationalization (Mendelsohn 2003). Secessionism is strongly associated with violent conflict (Toft 2003). In general, separatist civil wars last longer than other kinds of wars, implying that the warring parties cannot find negotiated settlements even when the conflicts are stalemated (Fearon 2004; Sorens 2012). I find that providing a legal path to independence is associated with less ethnonationalist rebellion (Sorens 2012). The United Kingdom, Canada, Denmark, and Belgium have had much less secessionist violence than France, Spain, and Italy — and secessionist violence has gone away in Puerto Rico since the U.S. government informally recognized their right to independence. Clauses permitting secession were also crucial to peace agreements ending the conflicts in Northern Ireland, South Sudan, and Bougainville (part of Papua New Guinea). The European Union’s Treaty of Lisbon explicitly recognizes member states’ right to secede from the Union, because no country would want to join a union they could never leave. on previously negotiated autonomy arrangements; only a right to secede may be sufficient to deter them and thereby induce secessionist rebels to lay down arms in the first place. I also find that central governments permitting a legal path to independence are more likely to decentralize to ethnic minority regions and have never recentralized power in the post-World War II era (Sorens 2012). If every country recognized its minority nations’ right to secede, only a few would apparently exercise such a right. Moreover, the overall level of global violence would likely decline by replacing intrastate conflicts with interstate conflicts. Intrastate conflicts are far more common than interstate conflicts (see Figure 2). Since World War 2, civil conflicts have killed seven times more people than interstate conflicts (Collier and Sambanis 2005; PRIO n.d.). Civil wars last much longer than interstate wars (Fearon 2004). Civil wars are also more likely to happen in more populous countries (Fearon and Laitin 2003). These findings suggest that a global increase in the number of independent states and a decrease in their average size would decrease the total number of conflict deaths. There are good reasons for the U.S. government to avoid assertively internationalizing other countries’ self-determination conflicts, which can look like meddling in other countries’ internal affairs. The U.S. arguably erred in refusing to negotiate a democratically authorized partition of Kosovo; as a result, an independent Kosovo lacks broad recognition from other states and is having trouble entering international institutions. Nevertheless, once a declaration of independence is issued, the U.S. government has no choice but to respond. In such an event, the U.S. government might wish to consider not only the interests of the host state, but also the interests of the seceding state and the effect of secession on regional stability. On average, replacing a state-to-nation relationship with a state-to-state relationship reduces violence. Ayres, R. William & Stephen Saideman. 2000. “Is Separatism as Contagious as the Common Cold or as Cancer? Testing the International and DomesticDeterminants of Secessionism.” Nationalism and Ethnic Politics 6(3):92–114. Collier, Paul & Nicholas Sambanis. 2005. Preface. In Understanding Civil War: Evidence and Analysis: Volume 1 (Africa), ed. Paul Collier & Nicholas Sambanis. Washington, D.C.: The World Bank. Data on Armed Conflict. 2013. Peace Research Institute of Oslo. http://www.prio.no/Data/Armed-Conflict/, accessed September 20, 2013. Fearon, James D. 2004. “Why Do Some Civil Wars Last So Much Longer than Others?” Journal of Peace Research 41(3):275–301. Fearon, James D. & David D. Laitin. 2003. “Ethnicity, Insurgency, and Civil War.” American Political Science Review 97(1):75–90. Hale, Henry E. 2008. The Foundations of Ethnic Politics: Separatism of States and Nations in Eurasia and the World. Cambridge, U.K.: Cambridge University Press. Howe, Paul. 1998. “Rationality and Sovereignty Support in Quebec.” Canadian Journal of Political Science 31(1):31–59. Mendelsohn, Matthew. 2003. “Rational Choice and Socio-Psychological Explanations for Opinion on Quebec Sovereignty.” Canadian Journal of Political Science 36(3):511–537. Sorens, Jason. 2005. “The Cross-Sectional Determinants of Secessionism in Advanced Democracies.” Comparative Political Studies 38(3):304–326. Sorens, Jason. 2012. Secessionism: Identity, Interest, and Strategy. Montreal, Que. : McGill-Queen’s University Press. Sorens, Jason. 2014. “Legal Regimes for Secession: Applying Moral Theory and Empirical Findings.” Public Affairs Quarterly 28(3):259–288. Toft, Monica Duffy. 2003. The Geography of Ethnic Violence: Identity, Interests, and the Indivisibility of Territory. Princeton, N.J.: Princeton University Press. Walter, Barbara F. 2006. “Building Reputation: Why Governments Fight Some Separatists but Not Others.” American Journal of Political Science 50(2):313–330. The United Kingdom currently sets the gold standard for management of secessionist politics. The British and Scottish governments negotiated in good faith over the terms of the independence referendum that Scotland held on September 18, 2014. If Scotland had voted to secede, the British government would have recognized its independence, thus affirming that the United Kingdom is a free partnership among its peoples. Spain presents a different scenario altogether. Catalonia intends to hold its own “consultation” on independence, but the Spanish government has denied its right to do so, thus denying that Spain is a free partnership. The Catalan government has repeatedly sought to hold negotiations on the self-determination process, but has been rebuffed. What ought the Catalan government to do? By the criteria set forth in this paper, Catalonia has tried to conform to a just institutional regime for regulating secessionist politics, while Spain has not. Catalonia would be justiﬁed in using all proportionate means to secure a just outcome. Constitute.org is a useful website designed by political scientists to let researchers search for and compare constitutional texts on particular topics. Here for instance is a search on secession clauses. Although one of the site’s creators, Zachary Elkins, says that 22 states contemplate some process for state divorce, only three constitutions expressly authorize some part of the country to secede: Ethiopia, Liechtenstein, and St. Kitts and Nevis. Ethiopia lets each people or nationality secede by a supermajority vote of its legislature, Liechtenstein lets each commune secede (I believe this was an addition of the 2003 constitution), and St. Kitts and Nevis lets Nevis secede by a supermajority referendum vote. In addition to these, Britain’s Northern Ireland Act of 1998 lets the majority of Northern Irelanders decide to join the Republic of Ireland, and the constitution of Uzbekistan lets Karakalpakstan secede with the consent of the Uzbekistan government. It would be interesting to see how many states define themselves as “indivisible,” thus tying a government’s hands and preventing it from authorizing secession. A search on the term brings up some irrelevant cases, but 72 constitutions contain the term. By the way, the Prince of Liechtenstein is a moderate libertarian, and their constitution is fairly consistent with the philosophy. Check out his book on the topic. Last week I was in Barcelona for two days, giving a talk at an event on “the right to decide,” sponsored by the Centre Maurits Coppieters (nonprofit arm of the European Free Alliance, the European Parliament group for ideologically mainstream minority nationalist parties) and by the Fundació Josep Irla (nonprofit arm of the Catalan Republican Left [ERC], largest pro-independence party in Catalonia). I also did some media interviews. You can see some excerpts of my interview with Catalonia’s TV3 evening news here (in Catalan). Now that the Spanish Constitutional Court has invalidated the consulta (consultative plebiscite) that the Catalan Government had authorized with the support of over two-thirds of Catalan MP’s and three-quarters of the Catalan electorate, the way forward is murky. An official consultation will not now happen. Instead, tens of thousands of volunteer poll workers are signing up to help with an unofficial poll that will involve ballots and ballot boxes and occur on November 9. It remains to be seen how successful the November 9 consultation will be. The pro-independence parties and civil society organizations are trying hard to mobilize voters and volunteers for the event. The anti-independence parties are boycotting the vote, as indeed are some far-left types who hate Artur Mas, such as the leader of the ex-communist, ecosocialist party ICV-EUiA, which otherwise supports the “right to decide” and remains agnostic on independence. If the November 9 consultation is successful, then the pro-independence parties will try to negotiate a “unitary party list” for early elections to the Catalan Parliament. They will treat this election as a plebiscite-by-proxy, and if an absolute majority of seats and votes go to the pro-independence list, Artur Mas will take it as a mandate for independence. However, several difficulties remain. The more radically independentist party, ERC, wants to declare independence right away after a successful “plebiscitary election.” Artur Mas’ party, Convergence and Union (CiU), is divided between independentists and those favoring a solution like confederation. (Technically, the party is a long-standing alliance between two separate parties, the now-independentist Democratic Convergence of Catalonia and the autonomist Democratic Union of Catalonia.) Generally, the last few days have seen more division and acrimony among secessionist leaders than the previous two years, and if it continues, that division will alienate voters. Civil society groups continue to call for unity among the pro-independence leaders. Another difficulty is that while a majority of Catalans with an opinion on the matter favor independence (a recent El Mundo poll had the anti-independence side ahead within the margin of error, but their polls have always been biased in an anti-independence direction), polls suggest the pro-independence parties would not together gain a majority in early elections. The reason for this is that many independentists are not in the secessionist parties. For a successful result, the “unitary list” will need to contain important leaders from civil society and non-secessionist parties. If the Catalan process stumbles now, it will be a shame, because it will show the Spanish government that they can face down demands for more autonomy simply by standing pat and threatening to arrest politicians. Spanish autonomous communities like Catalonia enjoy far less autonomy than American states (they are not allowed, for instance, to vary the overall tax burden from a central standard). Unless the polls are systematically biased or there is a late-breaking surge in support for “Yes,” the “No” campaign looks set to squeak by with a narrow victory in the Scottish independence referendum. On the betting markets, a “Yes” vote has plunged below an implied probability of 20%. What has this decline in the prospects for independence done to capital markets? In my last post on the subject, I found that British firms and the pound were nearly untouched by what was at the time significant momentum for “Yes,” but that a nine-firm Scottish equity index was hit hard. If those losses reflected unease about independence, then the latest news should have caused growth in my Scottish equity index. The biggest decline in the Yes team’s chances actually came overnight September 11-12, when the chances of Scottish independence abruptly fell about 10 percentage points on the release of new polls in the evening of September 11. (For a full list of recent polls, see Wikipedia.) The Yougov poll showing “No” in the lead (a dramatic reversal from its previous poll) seems to have been leaked just before the closing bell on September 11. Accordingly, I examine the performance of the Scottish equity index on the London Stock Exchange between 4:30 PM and 5:00 PM local time on September 11, when the odds of Scottish independence declined so rapidly. These are the nine stocks I include in the index: SL, SSE, FGP, WEIR, SGC, AGGK, WG, ADN, and MNZS. Of these, eight of nine rose on the poll news. Again, I weight by each stock by its market cap to create the index. The index rose 0.5% on the news, a rather small increase compared to the 1.7% decline after the shock Yougov poll showing “Yes” ahead. The overall patterns were pretty similar, though. The two transportation companies, Firstgroup and Stagecoach Group, were basically unchanged between the two. Energy-linked firms and Standard Life led gainers. Aggreko (temperature control systems) registered a small gain, and Aberdeen Asset Management a somewhat larger one. Roughly a ten-percentage-point drop in independence likelihood led to a 0.5% gain in the value of Scottish equities, less than a third of the loss in Scottish equities after an eight-percentage-point gain in independence likelihood just a few days prior. On balance, these results suggest we should revise downward the costs of secession suggested by the prior post. One objection to this interpretation might be that the leak of the Yougov poll just before the closing bell gave traders little time to respond. But this does not appear to be the case. The Scottish equity index was flat at the opening bell on September 12, suggesting that there was no new information for traders to consider. Here are two more interpretations. First, betting markets are less liquid and well-capitalized than financial markets. 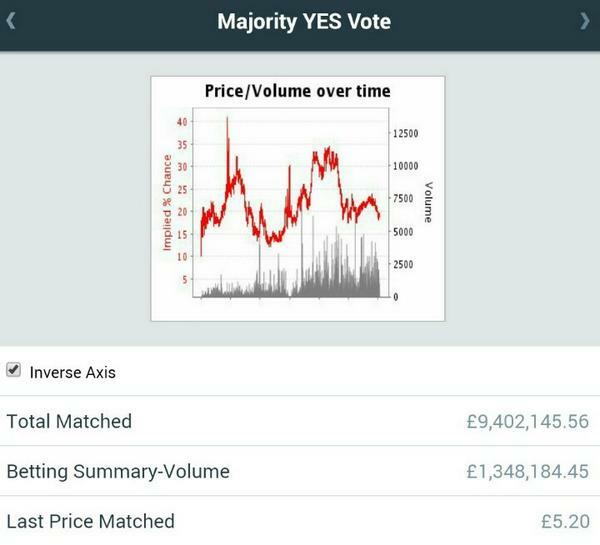 The actual gain in the probability of Scottish independence after the first Yougov poll may have been greater than the immediate response on betting markets. Second, the shock of a poll actually showing “Yes” ahead may have led traders to overestimate the likelihood of Scottish independence, and perhaps even the costs of secession (in a moment of panic). Having been inured to the initial shock and its aftermath, traders then took later news with more equanimity. Overall, though, the results are still suggesting net economic costs to Scottish independence. How much of the emphasis should be put on the “Scottish” part of that phrase and how much on “independence” remains a matter of debate, but clearly energy and financial firms are more affected than transportation and service ones.